During April vacation I brought my girls to see the New Bedford Whaling Museum. I had been there for research purposes relatively recently, but haven’t had the chance to really tour the museum since its major remodeling. I highly recommend it if you’re in the area. The Seamen’s Bethel (immortalized by Melville) across the street and the surrounding New Bedford Historic District are also fascinating. 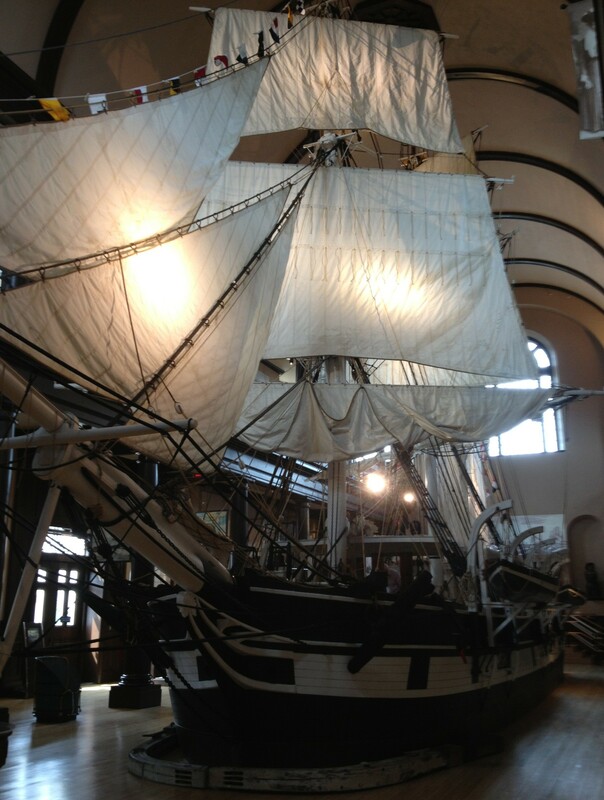 The centerpiece of the Whaling Museum is an amazing half-scale model of the whaleship Lagoda. The largest ship model in existence, 89 feet long, it was built in 1916 in the Bourne Building, donated by Emily Bourne in memory of her whaling merchant father, Jonathan Bourne, Jr. The Lagoda had been one of his most profitable ships and so was chosen, in a way, to become the emblem of New Bedford Whaling–the quintessential Yankee Whaleship. The ship was not originally constructed for the whaling industry. When I see images of the Lagoda model, or look at the thing itself, I confess I sometimes feel a tiny bit disappointed as the Whaling Museum does not make any reference to the merchant who originally commissioned the vessel. It is not vital information to their exhibit, I understand, so I don’t trouble myself too much over it. But, having a little something to do with promoting the history of Duxbury merchant Ezra Weston II (aka “King Caesar”), I sometimes wish it were noted that it was originally his ship. Ezra Weston & Son, based in Duxbury, was the largest shipbuilding and mercantile firm on the South Shore of Massachusetts. It was established by Ezra Weston I in 1764, then operated as a father and son partnership from 1798-1822 after Ezra Weston II became a partner with his father. The firm would be carried on by Ezra Weston II’s sons until 1857. 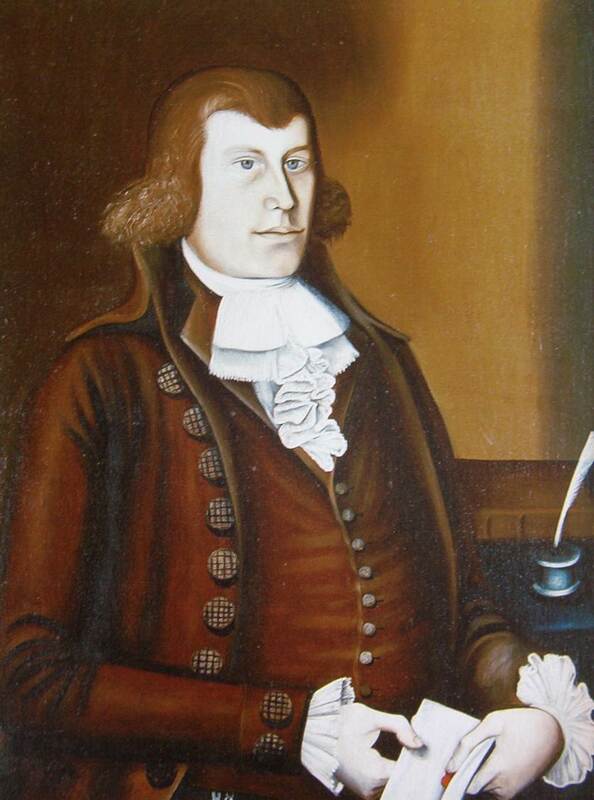 It is a bit confusing, I know, but both father and son were known as “King Caesar.” Ezra Weston I gained the nickname around 1803 when he began to emerge as the dominant merchant in the town. The precise circumstances as to how he gained the “royal” title is a different story, perhaps for another time. The sobriquet was then passed on to his son, Ezra Weston II, after the father died in 1822. It was Ezra Weston II who took the firm to astounding heights and international prominence. His home, known as the King Caesar House, is now a museum operated by the Duxbury Rural and Historical Society. When the first King Caesar died in 1822, Ezra Weston II, now sole proprietor, took some time to restructure the firm along bold lines. He brought in new master mariners to run some of the key merchant vessels in the fleet. He would soon commission much larger ships than his father had ever dared to build. He engaged in international trade more vigorously. And he stopped using the master carpenter that his father had employed. There is no specific evidence as to whether he fired the old overseer of the shipyard or if the man quit. But, either way, Ezra Weston II soon found himself with a shipyard and no master carpenter to run it. So, his only option in the mid 1820s when his Duxbury shipyard was in flux was to commission ships through other shipyards. This was a bit unusual in that one of the keys to the Weston firm’s success was vertical integration. He built his own ships and manufactured everything he need to outfit those ships. But, at this transitional stage, Ezra Weston II looked to the North River, another major center of shipbuilding on the South Shore. The North River formed the boundary between Scituate (part of which is now Norwell) and Marshfield and was the site of numerous active shipyards. Some of them had been in existence for more than a century producing vessels that were mainly sold to owners in Boston. Ezra Weston II, “King Caesar” (1772-1842) as a young clerk in 1793. King Caesar commissioned Seth and Samuel Foster to build three ships in 1825 and 1826 while he searched for a new master carpenter in Duxbury. There were a great many builders that Weston could have engaged, but apparently the Fosters attracted his attention. And for good reason. At the time, the Foster yard, known as the Wanton Shipyard in what is now Norwell (then known as South Scituate), was one of the most successful on the North River. In 1817 the Fosters turned out six vessels, a record for yards in that region. The North River vessels were exceedingly durable . L. Vernon Briggs, who wrote the History of Shipbuilding on the North River, was able to track down the whereabouts of several North River vessels still afloat at the time of his writing in 1889. Many of these vessels were nearly 70 years old by that time. The Pioneer, which King Caesar commissioned in 1825 and owned until about 1830, was still in operation more than 50 years later under different owners. And then there was the Lagoda. Ezra Weston commissioned the Fosters to build her in 1826. She was named for the Russian Lake Ladoga. Yes, there was a 19th century typo. The men who painted her transom spelled the name wrong. Even after this mistake was recognized, it was too late. Changing the name of a vessel was seen as bad luck by mariners. And so Lagoda it would be. I wish I knew why this name was chosen. I don’t know that it held any special significance to Weston or the Fosters. Perhaps it was simply the geographical significance of it being the largest lake in Europe that made it seem a majestic name. At any rate, Weston owned her for nearly seven years, employing her in trade with European ports including Havre, Antwerp, and Cadiz. She seems to have served the Weston firm fairly well. On February 25, 1833, Weston sold the Lagoda to Boston merchant William Oliver. In 1841, the year before King Caesar died, she was purchased by Jonathan Bourne of New Bedford and converted to a whaling ship. Bourne owned her for 45 years. She was known as a “greasy” ship, bringing in great cargoes of whale oil and tremendous profit to Bourne. Indeed, she was one of the most successful ships in the entire New Bedford whaling fleet. The Lagoda had a narrow scrape in 1871 when an early cold snap and shifting winds caught a large number of American whaling ships by surprise in the Bering Straights. As ice began to pack in around the vessels, dozens had to be abandoned. The Lagoda, beating a southerly course, barely made it out of the Straights in time. She then assisted in gathering up the crews of the abandoned ships. After New Bedford merchant William Lewis bought her, the Lagoda continued to sail the Pacific as a whaler. Finally, she was sold to Japanese owners who employed her as a coal supply hulk for the Japanese whaling fleets in the 1890s. Sometime after 1899 she burned and broke apart in Kanagawa, Japan. Such was the amazing lifespan of more than 75 years for a ship built on a small river in Norwell, Massachusetts. Patrick T.J. Browne, King Caesar of Duxbury, (2006), p. 75.